Qobo is the new inertial (and wireless) controller for media artists! Qobo is a cube, but it's not a simple one...it works with your laptop and gives you the ability to interact with your media contents to a different level, literally materialising your "virtual" ideas. ​It incorporates an inertial measurement unit, a RGB led and a simple haptic feedback, which are easily programmable and accessible via any programming software. It will only take few minutes to configure your Qobo and start interacting with your own application, as it works just like a standard serial device over bluetooth! Qobo is the perfect companion for your gear! It gives you 13 more virtual knobs/buttons to physically interact with your virtual creations, whatever they are! Each surface of Qobo can be marked with a "whiteboard pen" to visualise the function assigned...and can be easily rubbed out if you change your mind. Qobo is really easy to configure within any development environment. 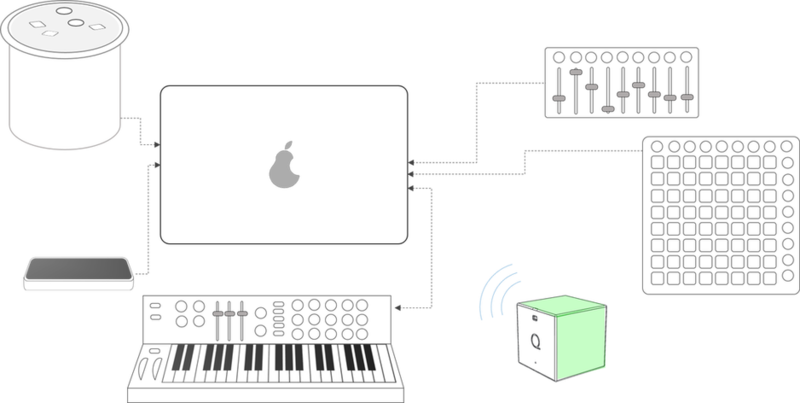 You can link it to a wide range of external devices such as Arduino and RaspberryPie, adding sensors, actuators, commanding projections and tangible interfaces, or send MIDI/OSC messages using intermediate apps like vvvv, puredata, Max Msp. ...because Qobo is essentially open Source! Qobo transmits serial over bluetooth messages! This means that you can easily capture Qobo's data stream in your favourite platform and shape your own application! Android and iOS are of course also supported. You can easily get access to informations such as: position, G force direction, Yaw Pitch Roll and more... and use them to write your own application and invent your personal use case. Qobo receives inputs too: you can customise the RGB colour scheme and make it vibe, flash, pulse, fade with rotation or steadily glowing.